During a magical visit to Barcelona I was completely captivated by Antoni Gaudí’s architecture. My husband and I saw every Gaudí site in town and were awed by the magic of his creations. What a visionary and what an amazing city for preserving and honoring his work. 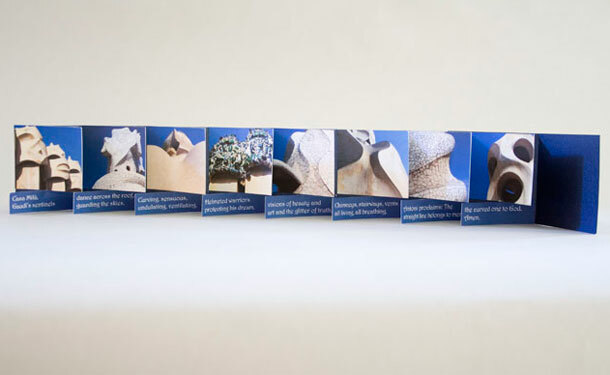 The eight photographs in this book feature Gaudí’s “sentinels” atop his Casa Milà (La Pedrera) apartment building. These sentinels are rooftop chimney stacks, vent caps and stairway entrances disguised with huge, fantastical sculptures. 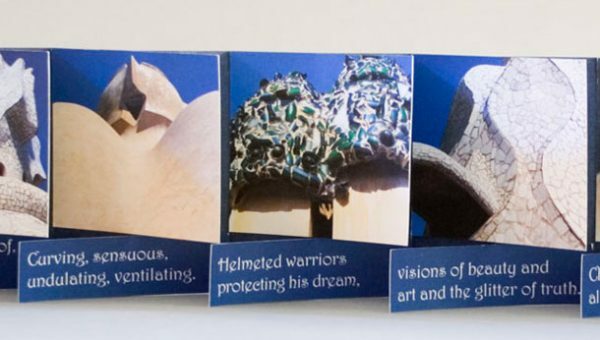 This book is a “miniature book” created using Hedi Kyle’s flag book structure. 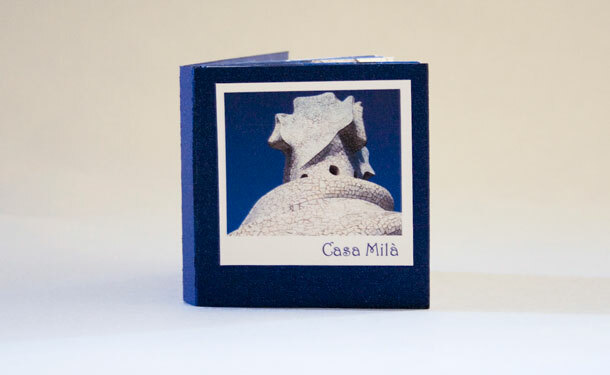 I like to think that as you open the book the sentinels dance across the sky just as they do in my dreams of Barcelona. Archival inkjet printing on Janus Duo Card paper with Fabriano Ingres accordion spine and Grupo Stardream soft wrap around cover. Original poem and eight original photographs. Size: 3″ x 3″ Opens out to 28″ long. ©2006. Edition of 25.